Since the release of MSA-2794220 by Microsoft, regarding the CVE-2012-4792 vulnerability, a Fix-it solution has been provided KB2794220. I urgently advise you to apply this Fix-it solution, or to use another browser, until the release of the final patch surely planned for the 8 January Microsoft Patch Tuesday. “CFR WATERING HOLE ATTACK DETAILS” from FireEye has been completed with additional information’s. “Internet Explorer Zero-Day Used in Watering Hole Attack: Q&A” from Symantec is also a pleasure to read. “CVE-2012-4792 – Analysis of today.swf” from StopMalvertising provide also interesting information’s. Let’s start with the analysis of only two samples, “news_14242aa.html” and “Helps.html“. These two samples are quiet interesting, and a complete blog post is enough for them. I will analyze the other samples in dedicated further blog posts. This sample was extracted from Google cache with a cache date of 7 Dec 2012 14:12:28 GMT. This sample clearly demonstrate that the compromise of CFR.org wasn’t the 20, or 21 December as mentioned by security companies or medias, but really sooner. The proof is still indexed and in cache of Google. I received this sample, around the 29 December. This file is the equivalent of the first sample but with some modifications, you can see the differences in the following online diff. Additional languages have been added (jp – ru – ko), all the stuffs regarding Microsoft Office documents have been removed (boy or girl), some additional “blank” locations have been added and the body text has been hide. Now, if you do research on VirusTotal with this MD5, you can find a relate sample, but with another filename “config.html” who was submitted the 2012-12-31 18:29:47 UTC. Looks like interesting, but has to be confirmed. If you execute a request on urlQuery in order to search all “config.html” file for the last past month, you will discover a submission, dating from 2012-12-29 22:58:29, for URL “http://www.capstoneturbine.com/_include/config.html” on server 74.62.198.72. If you take a look at the urlQuery report you can see some “deployJavaPlugin” strings. Capstone Turbine Corporation ® is the world’s leading producer of low-emission microturbine systems, and was first to market with commercially viable microturbine energy products. Capstone Turbine has shipped thousands of Capstone MicroTurbine systems to customers worldwide. By doing a Google dork research “site:capstoneturbine.com “_include”” you can see something strangely similar to CFR.org “news_14242aa.html“ file. This page is also cached in google cache, and guess what ? Ho, Ho Ho, CVE-2012-4792 is in the house since the 18 December 16:10:40 GMT. So CFR.org was and is not the only target of this attack ! On support.clean-mx.de we can discover that the same “/_include/config.html” URL was indexed since 2012-09-19 04:31:01. 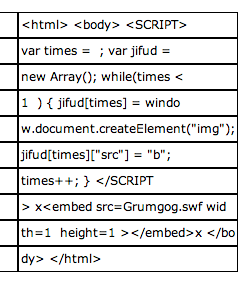 But what is awesome is the evidence attached to this submission hoho it is CVE-2012-4969 I discovered in September 🙂 “Grumgog.swf” is in the house. CFR.org was comprised since minimum beginning December. CVE-2012-4792 was present on CFR.org since minimum beginning December. CVE-2012-4792 was also used to target visitors of another company named Capstone Turbine Corporation. CVE-2012-4792 was present on Capstone Turbine Corporation since minimum 18 December. Capstone Turbine Corporation was also used to spread CVE-2012-4969 and this since mid-September. Potentially the guys behind CVE-2012-4969 and CVE-2012-4792 are the same. Jindrich Kubec director of Threat Intelligence at avast! confirm presence of CVE-2012-4969 in September on Capstone Turbine Corporation. Pingback: Microsoft ships emergency patch for IE6, IE7, and IE8 to fix vulnerability used in targeted attacks | Magento-Thailand.com | Magento, ????????????? Magento, ???????????????????? ??? @Jindroush @eromang Can you please contact me on this topic? We’d like to clean up whatever may be left over on Capstone’s site. Pingback: Website of US-based gas turbine maker also rigged with new IE exploit | UK feed poster. I’d like to resolve this, please contact me.